Trying to affix rhinestones on top of thermal transfer film is a bad idea. Here’s how to do it right! Demand for rhinestone decorated garments is still growing. Creating a rhinestone garment involves several steps and can be time consuming, especially if you’re creating island fills for large textual graphics. But rhinestones can also be combined with other garment decoration techniques to add visual appeal for the wearer and extra profit for you, the garment decorator. There are some limitations. 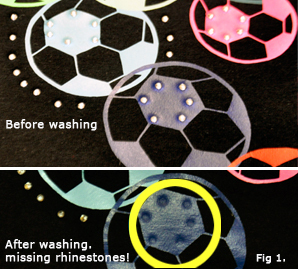 Hot fix rhinestones are designed to adhere to fabric, so they won’t necessarily stick to heat applied films. But adding a few well placed rhinestones can certainly spruce up your work and your margins. So how do you incorporate “bling” into your other decoration techniques efficiently? Here are a few techniques you can try with your next custom apparel order. If you’re working with text and spot color graphics, CAD heat transfer film is the most efficient and cost-effective decoration method for custom and short run garments. But the people want bling! Customers have asked us if hot-fix rhinestones can be applied on top of HotMark 70 or Easy Weed. In addition to the standard spot color films, we offer a wide range of metallic and metal flake materials like EnduraTex Metallic and Glitter. Adding rhinestones as accents is a simple way to enhance these films without the time and effort it takes to weed and entire island fill rhinestone pattern. So, does it work or not? The answer is a qualified yes. Our in-house testing concludes that the popular Korean hot-fix rhinestones adhere initially to HotMark 70, EnduraTex Metallic and similar products, but cannot be washed. As illustrated in Fig. 1, the stones adhere to the fabric and film, but cannot stay affixed to the polyurethane film during laundering. You can add rhinestones with thermal transfer as long as they don’t overlap. So if your end user is going to launder the garment, apply the stones only to the fabric around the film, not directly on it. If you only want to add a few random accent stones, you can do that quickly and easily by hand after the flex film is applied. For something more intricate, you can also design a rhinestone outline into your graphic using the design tools in your LXi Rhinestone Wizard or Graphtec iDesignR software. Here’s how to do it in LXI Rhinestone Wizard. Design your graphic so that the spot color graphic is separate from the stones and they don’t overlap. The Outline effect is an ideal tool for this task. Create your text. Then add an outline with a large enough offset to account for the width of the stones you’re going to use. Select the original text and load your cutter with the heat transfer film. Plot, weed, and apply it to your garment. Select the rhinestone pattern and load your rhinestone stencil film. Remember to change the tool and force settings on your vinyl cutter! Then plot the stone pattern as normal, weed the stencil, insert and transfer the stones (See our online Rhinestone Wizard tutorial for a complete presentation of this process). Overlay the stone pattern on the applied flex film graphic using the acrylic hot-fix transfer tape. Press at 320° for 20 seconds. Allow to cool, then remove the tape. Cover with a Teflon sheet and repress for a few seconds to seal the adhesive. 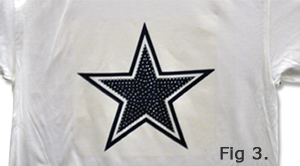 Inside of the star is rhinestones, outside of star is heat transfer material. The easiest way to overcome the hurdle of applying rhinestones to flex film is to replace the film with ink or dye. Combining hot fix rhinestones with dye sublimation or ChromaBlast cotton decoration allows you to place the stones anywhere in the design you please without worrying about washability. Since the hot fix rhinestones remain fixed anywhere on the garment you place them, you can put a rhinestone pattern on a field of color. (Fig 3) Rhinestones combined with a Sawgrass dye sublimation system can create some dazzlingly decorated custom garments. If your customers–or your accountant–prefer cotton shirts, combine rhinestones with a ChromaBlast t-shirt printing system. Combining ChromaBlast and rhinestone designs is a fairly simple process. Here’s how it works. Design your graphic and transfer it to a white cotton shirt with ChromaBlast, ink & paper. Transfer at 375° for 30 seconds and firm pressure. Peel hot. Reduce heat press to 320°F and allow to cool. While the press is cooling, place the stones in your stencil pattern. Cover with acrylic tape, squeegee, and lift to remove stones from stencil. Static electricity on the acrylic tape can cause some stones to pop out of your stencil, do a mid-air somersault, and land upside down and/or slightly out of place on the tape. Fix this with a wooden bubble popper tool. Use the needlepoint end to spear and flip the wayward rhinestones, then use the angled end to gently push them back into place. Place the masked pattern on the ChromaBlast decorated shirt, cover with Teflon sheet, and press as indicated above. Peel Cold. Obviously, mixing hot fix rhinestones with heat transfer film, ChromaBlast, or dye sublimation takes some design time and effort. Make it worth your while. A custom garment with rhinestones alone can retail for $25.00 or more. The additional visual impact of metallic heat transfer film or photo quality color only enhances its value. Don’t add them free unless you’re using the enhanced value to keep from lowering your prices in a tough market. Be creative. Mix rhinestones with complementary colors of matte and metallic films like Glitter, Galaxy or even fashion. How about a Cobalt Blue rhinestone outline around a graphic done in HotMark Fashion Denim? Your design flair can become a mark of distinction that sets you apart and boosts your bottom line. So go ahead and add some “bling” to your next custom apparel order. Let us know what your customers think.